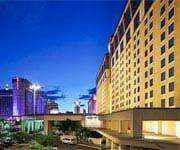 Save big with Las Vegas Suites! 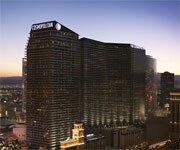 Up to 40% off at The Signature at MGM Grand. These top upscale Vegas hotels are on the infamous Vegas Strip. The 4.2 miles known as the Vegas Strip is jam packed with amazing hotels, restaurants, and nightlife. Some of the best Las Vegas upscale hotels are located right in heart of this entertainment epicenter. The list of upscale hotels Vegas on the Vegas Strip is full of heavy hitters with amazing amenities, pools, and casinos. The Venetian: Home to the hottest Las Vegas nightclub, Tao, and some amazing high-end restaurants, the romantic Venetian is one of the Las Vegas upscale hotels that accommodates the Vegas party scene. THEhotel at Mandalay Bay: With an actual beach, shark aquarium, and the bathhouse spa, THEhotel at Mandalay Bay is a luxurious take on a boutique hotel. This 5-star hotel on the Vegas Strip has an air of quaint elegance among the glittering lights of Vegas. Cosmopolitan: If you plan on spending a lot of time at the pool on your Vegas Strip vacay, Cosmopolitan Resort is the best of the upscale hotels in Las Vegas for you. Three different pool environments will give you sun-tanners a beautiful place to soak it up. Don't forget that sunscreen. AMAZING upscale Las Vegas hotels located off the Vegas strip. The glittering lights of the Las Vegas strip can be overwhelming. It's where the action is but there are plenty of upscale hotels in Las Vegas that aren't located on the Vegas Strip. Some of the most well known party-hard luxury hotels are Off-Strip and have incredible party scenes, amenities, and nightlife to make your trip to Vegas unforgettable. Palms Place Hotel and Spa: This multimillion dollar resort is one mile from the Vegas Strip and has everything you should come to expect from one of the best upscale hotels in Las Vegas. Known as one of the top party hotels in Vegas, The Palms gracefully combines pure luxury with a fantastic party scene to become one of our favorite upscale hotels in Las Vegas. M Resort Spa Casino: Located in Henderson, NV, M Resort Spa Casino is the ultimate in luxury located off the Vegas Strip. Guests can gamble their savings away at the beautiful 92,000-square-foot gaming area or head to the course for a day of golf. This is one of the Las Vegas upscale hotels that proves you don't have to be on the Vegas Strip to have a great time. JW Marriott Resort Spa and Casino: This 4-star classically luxurious resort has a full service spa, golf course, and casino. Everything you need to have a Vegas style trip without being in the hustle bustle of the Vegas Strip. Upscale Las Vegas hotels are for big-time ballers or those special occasion trips to Sin City, because even regular old Cheapos like you and I like to live it up from time to time - especially if it's on someone else's dime! (But we digress.) Whether it's your wallet or not, there's no denying that the top upscale hotels in Las Vegas are some of the best in the world, and they still offer more than their share of Las Vegas coupons to save a little bank. 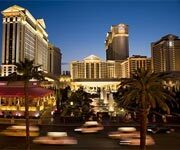 Upscale Las Vegas hotels range from elegant staple hotels like the Bellagio, to party-hard stays such as the Hard Rock Hotel and Casino. 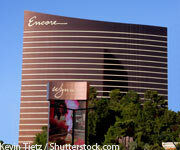 No matter what kind of experience you are looking to have, there are upscale Las Vegas hotels to fit everyone's ideal. As the self-proclaimed Entertainment Capital of the World, Las Vegas has some amazing accommodations for visitors to Sin City. From huge resorts and Vegas casinos to boutique inspired luxury Vegas hotels, this city knows how to put guests up in style at upscale Las Vegas hotels. Whether you want to spend your Vegas vacay right smack dab in the middle of the action on the Vegas Strip or stay in a more low key Off-Strip spot, there are Las Vegas upscale hotels to fit your need. When people think of Vegas they automatically picture the huge upscale Las Vegas hotels on the Vegas Strip. The Bellagio Fountains and emerald green exterior of the MGM Grand epitomize luxury in Vegas. The Vegas Strip encompasses the chaos of Vegas, and beautiful upscale hotels in Las Vegas give visitors a place to escape it all in elegance. Plus, many of the best Las Vegas deals can be found right on Las Vegas Blvd. If you're looking to stay off-strip, there are some great upscale Las Vegas hotels with incredible accommodations and amenities. There is no longer a stigma about staying off-strip that you can't afford to be on the Vegas Strip so feel free to explore these amazing Off-Strip Las Vegas upscale hotels. No matter what part of Vegas you want to be in for your next stay in Sin City, there are great upscale Las Vegas hotels all over the place. If you like to golf, there are hotels with private courses, or if you're looking for a high-class spa experience, Las Vegas upscale hotels are home to some of the countries best spas. 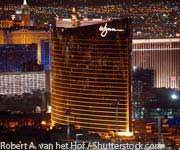 With so many incredible hotel choices in Vegas, there is something for every kind of Vegas vacation.